You never thought this would happen, but here you are. You’ve been charged with drunk driving. Virginia is tough on crime, including driving while intoxicated. With that said, there is still hope to have your charge reduced or dismissed altogether. In this guide, you will learn about your charge, some common defenses, and what you should do now to put yourself in the best possible position. 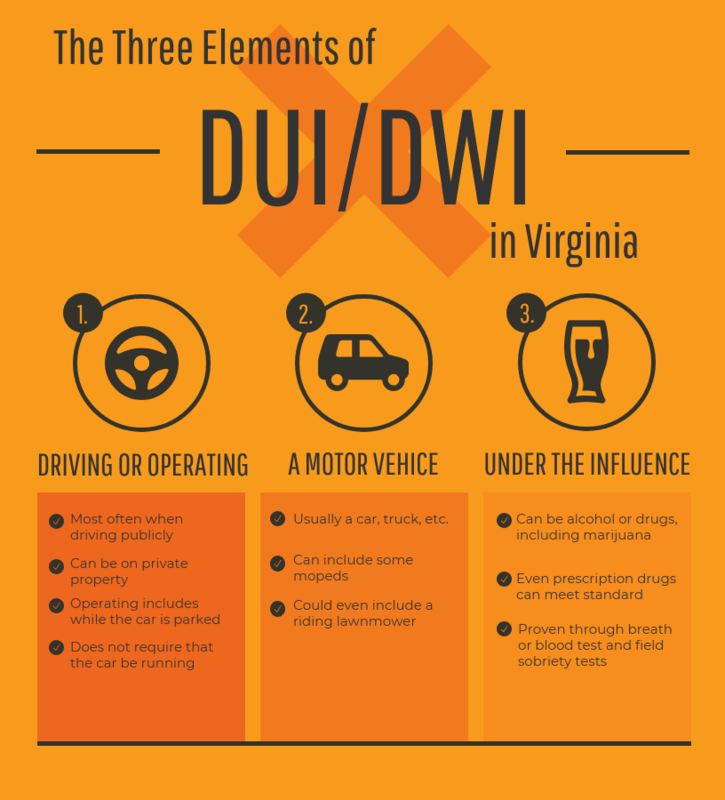 First, it is important to note that DUI and DWI are interchangeable in Virginia. Both DUI and DWI mean the same thing, and are charged under the exact same code section under Virginia law. When you have been charged with DUI, the government must prove three ‘elements’ beyond a reasonable doubt. If a judge or jury finds that the government has not proven all three of the elements of DUI beyond a reasonable doubt, the defendant must be found not guilty. The three elements that the government must prove are that the defendant (1) was driving or operating (2) a motor vehicle (3) while under the influence of alcohol or drugs. While these elements may seem straightforward at first glance, each can raise a number of issues. For instance, if a person is pushing a broken down car, is that enough to constitute ‘operating’ a motor vehicle? Would a riding lawn mower count as a ‘motor vehicle’? And what if the person is under the influence of legally prescribed drugs? Usually, the government will try to prove that you are under the influence based on the result of a breath or blood alcohol test. The prosecutor will also use your performance on field sobriety tests and your general demeanor and behavior to try to prove that you were under the influence. You will learn more about these issues later in this guide, for now it is important just to understand what the government must prove in order to convict you of driving while intoxicated. 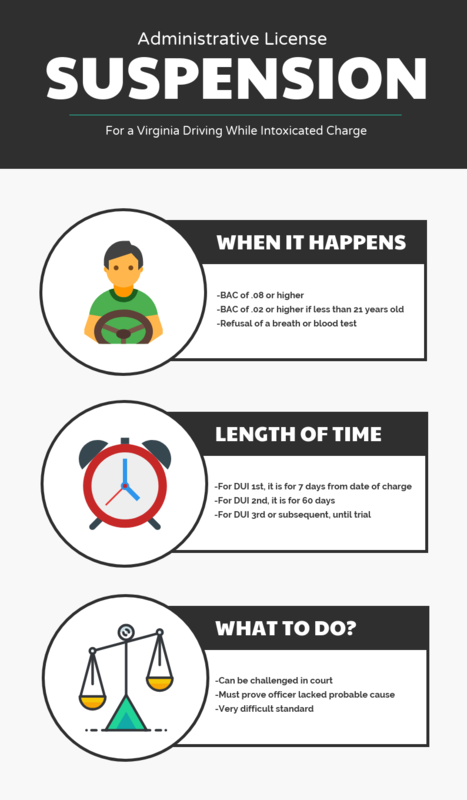 If you are convicted of DUI in Virginia, your punishment will vary drastically depending on blood alcohol content and the number of prior DUI convictions. For a first DUI with a blood alcohol content of .14 or lower, there is no mandatory jail sentence. A second conviction for driving while intoxicated within a ten year period calls for a minimum of 10 days in jail, while a third conviction results in a felony which can carry up to five years in prison. The period of license suspension also differs greatly depending on the same factors, ranging from a year to an indefinite suspension. Even on a first driving while intoxicated charge, if the driver is convicted of driving while at a blood alcohol content of .15 or above, the court must impose a mandatory minimum period of incarceration. Additionally, any conviction for DUI results in a requirement that you install an ignition interlock device on your vehicle which tests the your breath before allowing the car to start. The costs of installing and maintaining the interlock device are shouldered by the driver. As you can see, the punishment, even for a first offense, is burdensome and costly. For more serious cases, it can be life altering. (3) the defendant refused the breath test. If the defendant is charged with driving while intoxicated as a first offense, the administrative suspension lasts for 7 days. For a second driving while intoxicated charge, the suspension lasts for 60 days. If the defendant is charged with third or subsequent driving while intoxicated, the suspension lasts until the date of trial. A defendant can challenge the administrative license suspension in the court that has jurisdiction over his or her charge under Virginia Code 46.2-391.2. If the person proves to the court by a preponderance of the evidence that the arresting officer did not have probable cause for the arrest, that the magistrate did not have probable cause to issue the warrant, or that there was not probable cause for issuance of the petition, the court must rescind the administrative license suspension. Field sobriety tests are administered or offered in almost every case of driving while intoxicated so long as the suspect appears physically capable to the investigating officer. The tests serve two purposes. First, the officer will use the tests to make the initial determination whether a suspect should be investigated further and whether the suspect should be arrested for driving while intoxicated. Second, the suspect’s performance on the field sobriety tests will be used at trial by the prosecutor in order to support a finding of guilt. There are many ways to challenge the field sobriety tests. First, many of the tests were developed under standardized laboratory conditions. There is a great difference between a well lit office space and the side of the road with cars speeding past and the blinding emergency lights of a police car. Second, there are a good number of ‘indicators’ of intoxication that an officer is looking for in each tests. If the officer does not testify or make a note that a suspect did not perform a certain part of the test correctly, it is a safe bet that the suspect did that part of the test correctly. An experienced attorney can effectively bring this type of information out in a trial to raise doubt about the field sobriety tests. When administering the one-leg stand test an officer will instruct a suspect to stand with one foot approximately six inches from the ground and count out loud to a specific number. Most officers instruct the suspect to perform the test for 30 seconds and to count out loud by thousands (one-thousand-one, one-thousand-two, etc.). Generally officers will allow a suspect to choose which leg they stand on. While each officer will conduct a test with slight variation, officers are trained in the administration of field sobriety tests and for the most part the administration of the one-leg stand test is similar between different police officers. As with several of the field sobriety tests, the one-leg stand test has been designed and promulgated by the Department of Transportation National Highway Traffic Safety Administration (NHTSA). (4) putting the foot down. The officer will also be looking to see if you skip numbers or otherwise fail to count to the number at which they have instructed you to stop counting. Stopping too soon, or continuing past that number, will both be marked as indicators that you are intoxicated. The “nine step walk and turn” or “walk and turn” test is a divided attention field sobriety test. Divided attention tests require that a person listen to, remember, and follow instructions while performing a physical task. In the walk and turn test, the suspect is instructed to walk nine steps along a straight line touching heel to toe. Typically the subject is directed to walk on an imaginary line as opposed to an actual painted line on the shoulder of the road. Suspects are asked to take nine steps out, turn on one foot, and then take nine steps back. Many officers also ask the suspect to count out loud at each step and not to raise his or her arms. As with most of the field sobriety tests, the walk and turn test has been designed and promulgated by the Department of Transportation National Highway Traffic Safety Administration (NHTSA). (8) the suspect takes in incorrect number of steps. The finder dexterity test consists of the officer instructing a suspect to touch the tip of each finger to the tip of the thumb on the same hand, counting out loud as they do. Many officers will instruct suspects to tap the last finger two times and then count back down again, so that they are counting: 1, 2, 3, 4, pause, 4, 3, 2, 1. Officers typically allow the suspect to choose which hand to use for the test and sometimes allow the suspect to count in Spanish or another language if it is more comfortable for them. The finger dexterity test is not among the battery of standardized field sobriety tests developed by the Department of Transportation National Highway Traffic Safety Administration (NHTSA). Additionally, the finger dexterity test has not been studied as extensively as the tests included in NHTSA’s battery of standardized field sobriety tests. Officers do not have the benefit of an enumerated list of indicators for intoxication with this and other tests that are not included in the NHTSA standard battery. 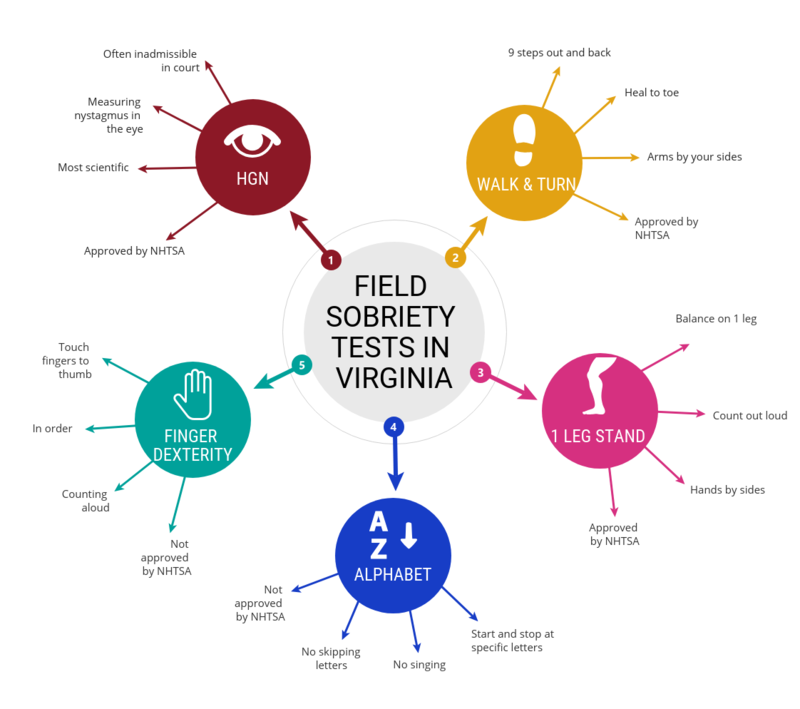 While the Alphabet or “ABC” field sobriety test is not a standardized field sobriety test, it is nonetheless administered with regularity by officers in Virginia. The ABC test is a divided attention test, meaning that it requires the subject to listen to and remember the instructions to the test while performing a task. The officer will typically ask the suspect to recite the alphabet without singing from one letter to another. For example, the officer would ask the suspect to recite the alphabet from D to T without singing. The officer will look for mistakes such as singing the alphabet, starting at the wrong letter, stopping at the wrong letter, repeating a letter, or skipping letters. There are a number of challenges that can be made to this test. For instance, if English is not the suspect’s first language, this test can be much more difficult to perform than for a suspect who was born and raised with English as a first language. Additional, if the officer does not demonstrate the correct way to do the test, the results can be called into question. The Horizontal Gaze Nystagmus Test (“HGN”) is one of the three standardized field sobriety tests promulgated by the National Highway Traffic Safety Administration (“NHTSA”) of the Department of Transportation. Nystagmus is an involuntary jerking of the eye that occurs as a result of certain conditions, including impairment as a result of alcohol and drug consumption. The test has three parts. First, the officer holds a pen approximately a foot from the suspect’s face and moves the pen from the center of the face to the left or right ear. In this portion of the test, the officer is looking for whether there is a ‘lack of smooth pursuit’ of the eye as it tracks the moving pen. If the eye can not follow the pen smoothly, but instead stops and jerks to catch up to the pen, the officer will take this as an indication that the suspect is impaired as a result of alcohol or drug consumption. Second, the officer will hold the pen at ‘maximum deviation’ and look for a jerking of the eye. The officer will hold the pen at that maximum deviation for at least 4 seconds to check for a ‘distinct nystagmus’ or jerking of the eye. Third, the officer will check to see if there is an onset of nystagmus prior to a 45 degree angle as the pen is moved from the center of the face to the left or right side of the face. In order to admit the HGN test as evidence, the Commonwealth must establish a basis for the scientific reliability of the test. In order to accomplish this, the prosecutor must typically qualify the officer who administered the test as an expert in the HGN or field sobriety tests as a whole, which can be difficult depending on the officer’s familiarity with the scientific underpinning of the HGN test. While it can often be difficult for the prosecutor to get the HGN test admitted into evidence, if that hurdle is met the test is often considered the most reliable field sobriety test. This is because it does not take into account the suspect’s ability to perform a physical task that requires balance such as the walk and turn test or the one leg stand test which could vary widely from person to person regardless of alcohol or drug consumption. In almost every DUI case that happens in Virginia, law enforcement will offer the suspect a breathalyzer test on the side of the road before the arrest is made. 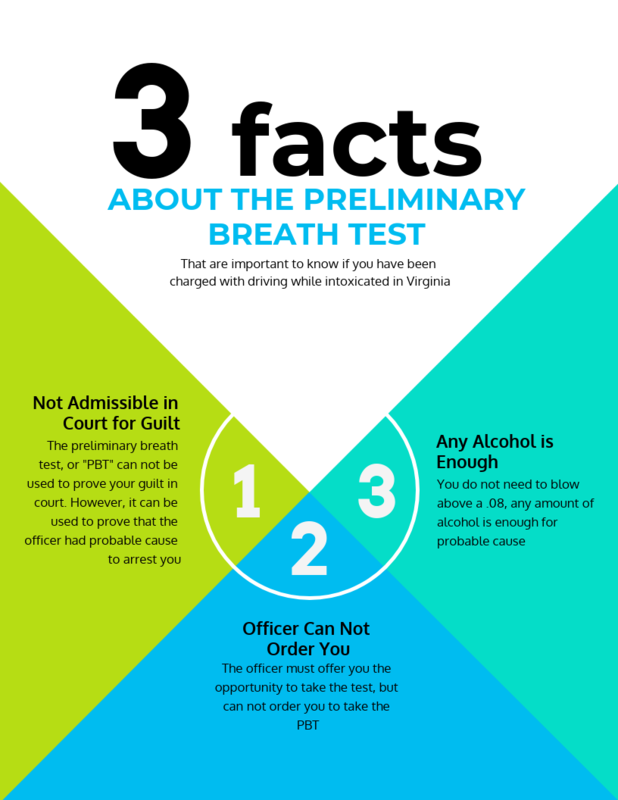 This test is known as the ‘preliminary breath test’ and is used by the officer to determine whether probable cause exists to arrest the suspect for driving while intoxicated. The suspect is actually entitled under Virginia Code 18.2-267 to have his or her breath analyzed to determine the probable alcohol content so long as the equipment necessary to analyze breath is available to the officer. If the test indicates that any alcohol is present in the suspect’s blood, the officer may charge the suspect with driving while intoxicated. You read that correctly. You do not need to blow above a .08 for the officer to have cause to arrest you. Any amount of alcohol is enough. While the test can be used by the officer to determine whether there is probable cause to arrest the suspect, the results of the test can not be used in court to prove the a defendant is guilty of driving while intoxicated. However, a positive result on the preliminary breath test takes away an important weapon in the defendants arsenal at trial – a challenge to whether the officer had probable cause to arrest the defendant. If the defendant moves to suppress evidence based on lack of probable cause for his or her arrest, the results of the preliminary breath test are then admissible to prove that the officer was justified in making the arrest. When a suspect refuses to take the preliminary breath test, Virginia Code 18.2-267 states that failure to permit such analysis shall not be evidence in any prosecution for DUI. Thus, the code specifically states that refusing to take the breathalyzer test at the scene can not be used as evidence of guilt. However, the Virginia Court of Appeals has held in Jones v. Commonwealth that refusal to take field sobriety tests can be considered by the Court as evidence tending to support a finding of probable cause to arrest. While there is no case specifically on point with regard to refusal to submit to a preliminary breath test, it can certainly be argued that refusing to submit to the test could be used against the defendant in order to establish probable cause. This seems to indicate that you are in a damned if you do, damned if you don’t situation when it comes to the preliminary breath test. 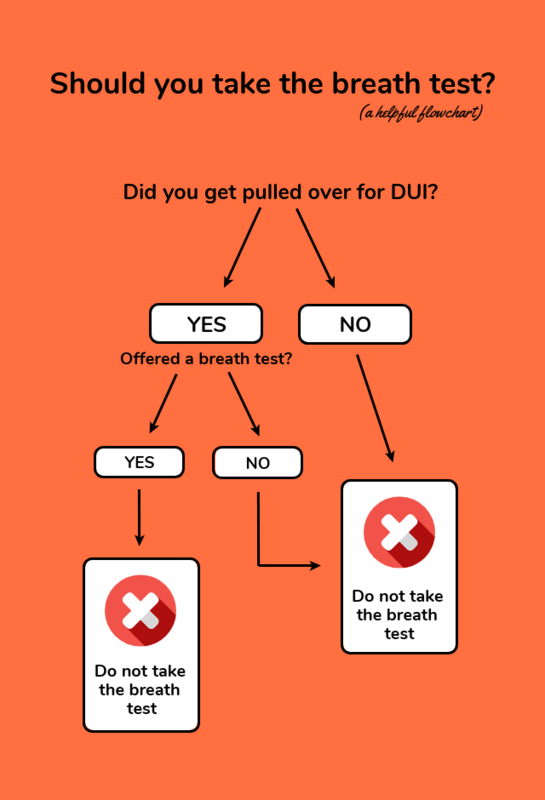 All things considered, you are typically in a better situation at trial if you refused the preliminary breath test. If you took the test and it registered any amount of alcohol, it puts you in a position where you have a very low chance of successfully arguing that the police officer lacked a valid reason to arrest you. After an arrest for DUI in Virginia, the suspect is typically taken to the police station and given a breath test. The results of that breath test constitute the strongest form of evidence against the defendant at trial. The first portable breathalyzer that could measure a subject’s blood alcohol level based on a breath sample was created in 1954. Since then, the technology used to determine alcohol concentration in the breath has evolved and the use of both stationary and handheld breathalyzers has become the norm. The National Highway Traffic Safety Administration maintains a Conforming Products List of devices approved for evidentiary use, as well as for preliminary screening use in the case of a preliminary breath test. The Intox EC/IR II is the only breath test machine that is approved by the Virginia Department of Forensic Science for evidentiary use in the Commonwealth of Virginia. Unlike the preliminary breath test, taking the test on the EC/IR II at the police station is a more methodical and routinized system. The whole process will typically take a half hour or more, during which an officer must follow a strict set of guidelines in order to obtain a sample of your breath that can be used in court. Any person who operates a motor vehicle on the highways of Virginia is deemed to have consented to having sample of his breath or blood taken for a chemical test to determine the alcohol or drug content of his blood. Typically, after an individual is arrested for driving while intoxicated, the officer will take the defendant to the police station and request that the defendant take the breath test. If the defendant refuses to take the test, the officer will then explain implied consent to the defendant and tell him that if he does not take the breath test, he will be subject to the additional charge of refusal. There are some circumstances under which implied consent does not apply, which can be very important depending upon how the officer presented the test to the defendant. Under Virginia Code 18.2-268.9, chemical analysis of a person’s breath must be conducted by a person with a valid license, with a type of equipment and in accordance with methods approved by the Department of Forensic Science (DFS). The government often has difficulty producing testimony or other evidence to indicate that the breath test was conducted in accordance with the methods approved by DFS. For instance, under Virginia Code 9.1-1101, the Department of Forensic science shall “test the accuracy of equipment used to test the blood alcohol content of breath at least once every six months. It is often difficult for the government to produce a witness or otherwise prove that the breath machine has been tested and calibrated. While the Virginia Supreme Court has recently held that failure to produce such evidence is not grounds for exclusion of the certificate of breath alcohol analysis in court, the failure to prove that the breath machine has been calibrated can still be considered in determining how much weight the court gives the result of the test. GERD, the symptom of which is commonly known as heartburn, has the potential the manipulate the result of a breath alcohol test. In order to arrive at an estimated blood alcohol content, the Intox EC-IR II takes a sample of breath from the subject and multiplies that sample many times over. The EC-IR II is designed to measure the alcohol concentration in the deep lung tissue, known as “alveolar air.” This is the reason that the subject is required to breath deeply into the Intox EC-IR II at a constant rate for a over a few seconds. At the end of the breath sample, when the rate of exhalation begins to decrease, the EC-IR II takes the sample of alveolar air that it will use to arrive at a estimated blood alcohol concentration. It is essential that no alcohol from the mouth or stomach interfere with the breath sample. The law requires that the breath technician observe the subject over a 20 minute time period prior to administering the test in order to make sure that the subject does not drink or regurgitate. This is where GERD comes into play. GERD causes stomach acids, possibly containing alcohol, to travel from the subjects stomach up to the mouth and throat. And, unlike burping or vomiting, GERD, acid reflux, or heartburn is not easily observable by a police officer or breath technician. The alcohol released from the stomach into the mouth and throat can greatly inflate the estimated blood alcohol content of the subject. If you suffer from GERD, you should raise this issue with your attorney to see if it might be raised as a defense to the results of your BAC as measured by the breath test. While Virginia Courts have held that the it is possible to violate the driving while intoxicated laws on private property, it will give the government problems when trying to introduce the certificate of breath or blood alcohol analysis into evidence when the driving or operating of a motor vehicle does not take place on a public highway. When driving takes place on private property, implied consent no longer applies. In fact, there is support in Virginia case law for the proposition that because implied consent does not apply, the breath test certificate can not be introduced into evidence under any circumstances. This charge can be civil or criminal depending upon the defendants criminal and driving history. If the driver has previously been convicted of a DUI or refusal, the Commonwealth may then charge the driver with criminal refusal. If the driver has not previously been convicted of DUI or refusal, the charge will be civil. Even a first refusal charge carries a debilitating punishment in Virginia – a driver’s license suspension of one year without the possibility of receiving a restricted license to go to work, school, and for any other purposes. For a second or third refusal, the driver will be charged with a misdemeanor and if found guilty the driver’s license will be suspended for an additional three years. Again, with no restricted license privileges. Law enforcement must stick to a strict set of statutory guidelines in order to meet the requirements necessary to convict a driver of refusal. While police officers will typically comply with these requirements, it is important to investigate thoroughly. In Virginia, various law enforcement agencies, such as the County Police Departments and the Virginia State Police, utilize sobriety checkpoints to arrest drivers for DUI. These checkpoints generally involve police officers setting up a roadblock, stopping drivers, and examining them for signs of intoxication. This examination usually consists of an alcohol breath test, but the officers may also ask the driver to complete roadside field sobriety tests – a series of activities designed to test cognitive and motor skills. Failure to pass one or more of these tests may lead to an arrest for Driving While Intoxicated (DWI/DUI). Sobriety checkpoints were held constitutional by the United States Supreme Court in Michigan Department of State Police v. Sitz. The court held that the checkpoints were seizures under the 4th Amendment of the United States Constitution, but that they could be constitutional if they were reasonable seizures. To be reasonable, the police must follow a set of guidelines set out by the courts. These guidelines attempt to balance the government’s interest in preventing drunk driving against the interest of the individual in limiting unnecessary intrusiveness. Among other considerations, the checkpoints must be pre-planned, use a mathematical formula when selecting which vehicles to stop, and keep officer discretion to a minimum. Virginia police officers are not allowed to decide who to stop or how to perform sobriety tests, but are instead required to follow a set plan designed to keep the searches as neutral as possible. If the police do not follow these guidelines, the Court may consider their search unreasonable, and any evidence procured from it, including breathalyzer results, would be excluded as evidence to be used in a DUI/DWI trial. Defenses to the charge of driving while intoxicated vary widely depending on the circumstances of the case. If there was a breath alcohol sample taken, the records of the machine used to analyze a driver’s breath may be requested from the Department of Forensic Science. Depending on the history of the machine, its maintenance, and records of the test you may have arguments as to the weight a court should give to the results of that breath test or even its admissibility in court. The location of the stop of the vehicle can also be of great significance. 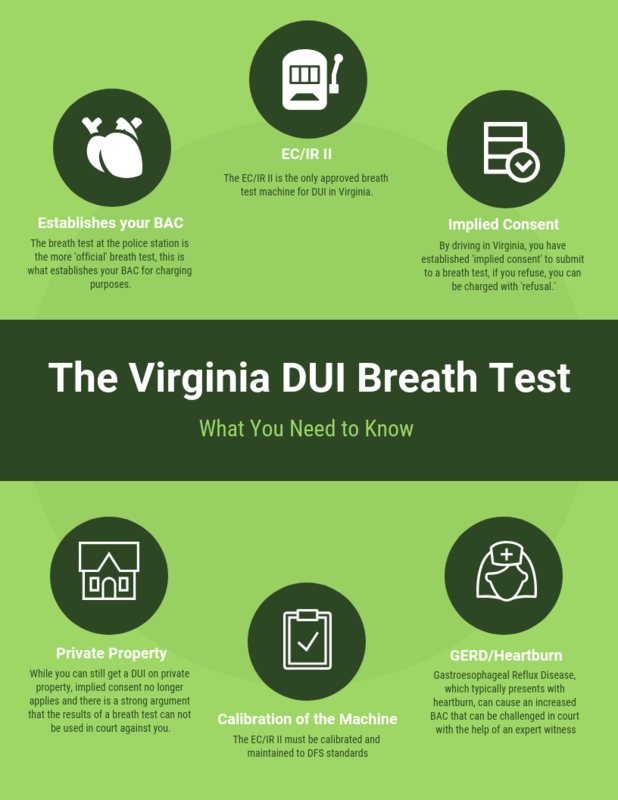 While it is possible to be guilty of driving while intoxicated on private property, Virginia’s implied consent law for breath or blood tests does not apply unless the driver is on a public highway. Depending on the circumstances of the arrest and what form of proof the government intends to introduce, this fact could be of pivotal importance in excluding the test results from your trial. The Constitution affords protection for individuals against an unreasonable search and seizure by law enforcement. This extends to both the reason an officer must have for pulling a driver over and for the reason an officer must have for arresting the driver. Depending upon the circumstances of your case the stop of your vehicle or your arrest may not pass constitutional muster. In cases where the Commonwealth intends to admit the result of a breath or blood test into evidence, the expert testimony of a toxicology might be helpful to the driver’s defense. It is important that your attorney understand both how these tests are conducted as well as how an individual’s health issues or medications might affect the tests or an individual's behavior so that a toxicologist can be consulted and possibly used at trial under appropriate circumstances. Police officers typically ask a suspected drunk driver to perform a number of field sobriety tests. A suspect's performance on those tests can be used both to establish probable cause for an arrest and to find the defendant guilty of driving while intoxicated. An experienced attorney can challenge these tests through cross examination. Sometimes, performance on the field sobriety tests can be a boon to the defendant where the performance can be spinned in a favorable light to the court. 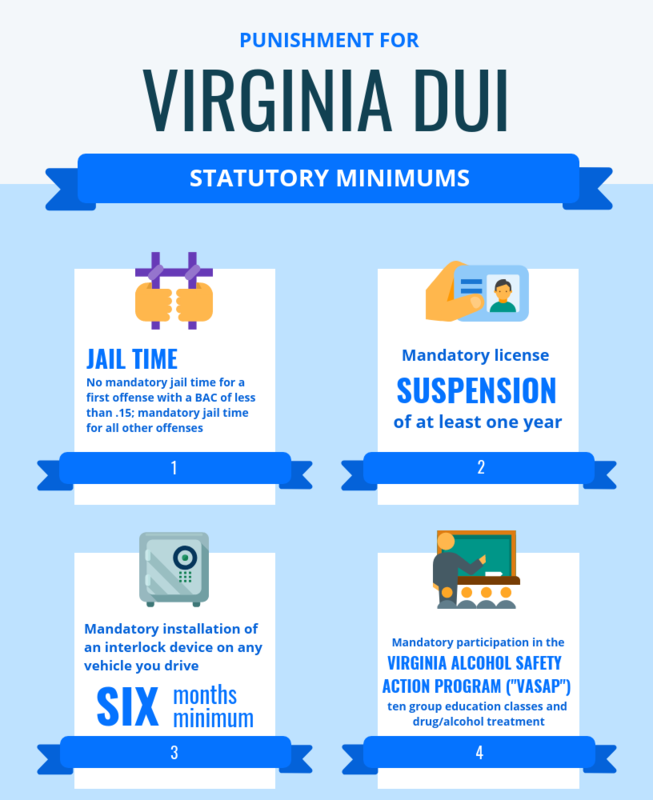 Each court in Northern Virginia has developed their own procedures and culture when it comes to DUI charges. The court or county where you are charged will impact the number of court dates you attend, how your attorney obtains the evidence against you, how and when your attorney can negotiate with a prosecutor, and even which arguments are most likely to win at trial. Our attorneys regularly handle DUI’s in all of the Northern Virginia courthouses. We know the judges and prosecutors, so we can tell you what to expect and advise you about how to proceed in your case. Fairfax County is the largest jurisdiction in Northern Virginia and Fairfax County police made over 2,000 DUI arrests last year alone. The Fairfax General District Court handles DUI cases on their regular “traffic” docket, with other charges such as speeding tickets and reckless driving charges. Most days, there are 5 courtrooms of traffic cases, all beginning at 9:30 am and each handling 200 or more cases. The judges typically handle shorter, more simple cases first, such as speeding tickets, expired inspections, and HOV violations. While the judge works through those cases, attorneys meet with police officers and prosecutors to discuss more complex charges, such as DUI’s. It is not unusual for the DUI trials to last until 1:00 pm or even later, even though they were set on the 9:30 am docket. If you are charged with a DUI in Fairfax County, your first scheduled court appearance will be an arraignment. The police officer will not be present, because the court is not addressing the substance of your charge. Instead, the court will formally advise you of your charges, and then determine what you are going to do about an attorney. Defendants who are indigent can request a public defender at this stage. If you have already hired an attorney before your arraignment, he can enter paperwork with the court to waive this court date so that you don’t have to appear. You should definitely hire an attorney before the next court date. At this hearing, the prosecutor will provide your attorney a copy of the police report and a DVD with the officer’s dash cam video. Nearly all Fairfax County police cruisers have working dash cam at this time. The video also typically records the person in the backseat of the police car after arrest for the entire ride to the police substation or jail. The police officer will be present at this court date, so your attorney can take the opportunity to ask any questions they have before they prepare for trial. Then your attorney and the prosecutor will agree on a date for your trial. The date could be as soon as one month or as many as 3-4 months away. If your blood was taken and tested at the lab, your case will be set on a special “blood docket” scheduled periodically when a representative from the Department of Forensic Science will be present to testify in all blood cases. Before your final trial date, you and your attorney will have a chance to review the report and video. Our attorneys walk in to every DUI case prepared for trial. While negotiation is an important part of the process and sometimes gets the best result for people, it is only effective when your attorney is fully prepared and ready to try the case. This is especially important in Fairfax, where prosecutors do not discuss DUI cases ahead of the court dates with defense attorneys. All negotiation is done the morning of trial after the 9:30 docket begins. If the offer is not good enough to take, or if we realize that we have had success arguing certain issues in front of the judge assigned to your case that day, we must be ready to go to trial immediately. 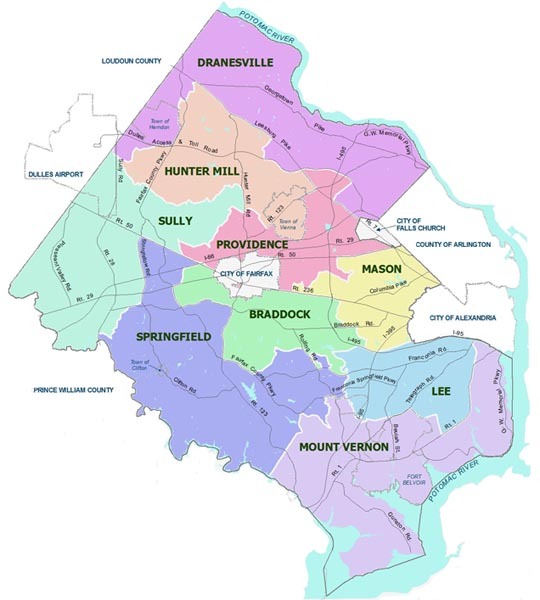 DUI charges in Arlington are handled slightly differently than in Fairfax. It is a smaller jurisdiction and correspondingly the court is less busy. If you are charged with DUI in Arlington you will attend an arraignment, where the judge will advise you of your specific charges and ask if you are indigent and need a public defender. At that arraignment, you will be given your trial date. It is important to hire a lawyer as soon as possible after arraignment if you are not able to hire one beforehand. Unlike in Fairfax, which has a “preliminary” court appearance for gathering evidence, the Arlington court will expect you and your attorney to be ready to go forward with trial on that court date. This means that your attorney must make arrangements ahead of time with the prosecutor’s office to view the evidence in your case and file any suppression motions on your behalf in writing before the court date. In Arlington, the prosecutor’s office typically will not give your attorney a copy of the reports and video to take and review with you. Instead, your attorney must view them at the prosecutor’s office and take detailed notes of what the evidence contains. Because Arlington assigns prosecutors to DUI cases before the trial date, your attorney may be able to reach the prosecutor by phone to discuss the case. This can be helpful when attempting to negotiate for reduced or no jail time, and when determining whether to subpoena witnesses for trial. However, sometimes the prosecutor wants to wait until the trial date to speak personally with the officer before making any offers. Alexandria DUI charges are handled in a similar way to those in Arlington. After a DUI charge, you will be scheduled for an arraignment. This hearing is often set very quickly, sometimes just a few days after your arrest. If you have already hired an attorney, he can call the prosecutor’s office before arraignment to select your trial date and then you won’t have to appear. If you haven’t hired an attorney yet, it is fine to appear alone at your arraignment. Once you hire an attorney, he can make an appointment to view the evidence in your case at the prosecutor’s office. The evidence packet will include your criminal and traffic records, the police report, breath alcohol sheet, and a video if there is one. After viewing the evidence, your attorney can walk you through the best arguments in your case and begin preparing for trial. Some arguments, such as suppressing a stop or arrest, should be submitted to the court and prosecutor’s office in writing ahead of the court date. As the trial approaches, your attorney may reach out the the prosecutor assigned to DUI cases to start negotiating and discussing the issues for trial. It is possible to come to an agreement before the court date, but also not unusual for negotiations to continue right up until the morning of trial. Your attorney will also be preparing for trial and ready to advise you about the best option after finding out the prosecutor’s planned arguments, the police officer’s testimony, and the judge assigned to the case. So that is our guide for Virginia driving while intoxicated. Now I want to turn it over to you. What did you think about this guide? Is there a topic you would want covered that you did not find here?